The turquoise river Nadiža originates in Breginjski kot. Its source lies beneath the Stol. Rivers torrential nature creates several sandbars, pools and gorges. Nadiža is one of the cleanest and warmest alpine rivers and her waters supposedly heal wounds and other ailments. Nadiža starts up as Black stream in Breginjski kot. 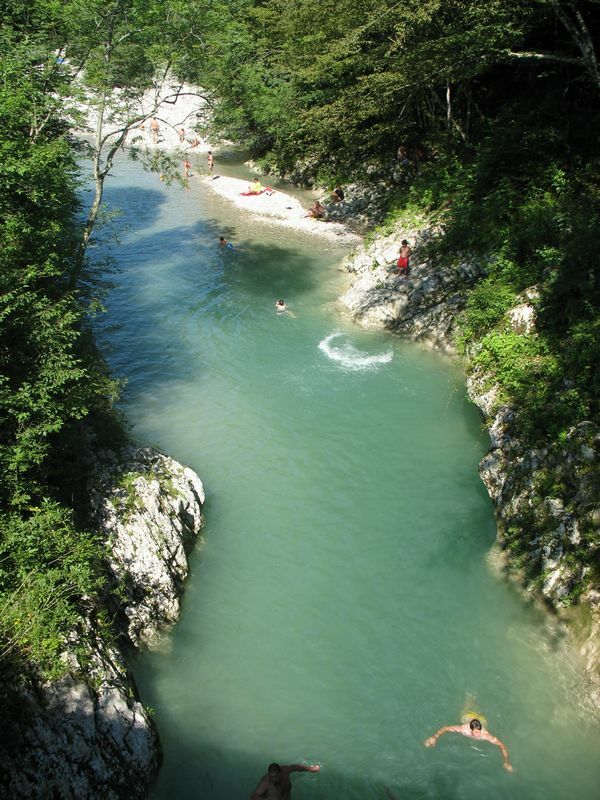 From the confluence of White and Black stream till the mouth of Legrade she runs south as the border river between Slovenia and Italy. In Logje the river turns southeast and then in Kred southwest. Nadiža cuts a deep valley between Mija and Matajur and flows into Friuli. The upper part of the river has alpine river features, which change into subalpine in Logje. Nadiža flows into Ter (Torre) after 60km. Nadiža is very suitable for swimming, because of high water teperature and quiet flow. There are several endemic fish species in the Nadiža such as marble trout, european bullhead, chub, barble and souffia. The river is also inhabited by several species of invertrabraits such as the endemic Carinurella paradoxa. The riverbanks are mostly unregulated and host several endemic plant species such as Berini hawkbit (Leontodon berinii). The riverbanks are mostly grassy or covered with willow trees. The swimming area is under the bridge, about 500m from the village of Podbela towards Robidišče. There is a parking space nearby. The swimming area is under the Napoleon’s bridge, about 1500m from the village of Podbela towards Robidišče. There is a parking space nearby. The swimming area is by the main road, about 500m from the village of Robič towards Italy. There is a parking space nearby. The swimming area is about a kilometre west of village Kred. The swimming are is under an iron bridge near the village of Logje. You get there by driving through Logje towards the iron bridge over Nadiža. You can also get here from Podbela by driving towards Robidišče and turning right for Logje after 2km. The parking space is about 50m from the iron bridge. Nadiža literally means a stream which has a very strong spring. The spring of Sava in Planica valley has the same name. In Italy the river is called Natisone and near Aquileia (as a strong groundwater spring) Natissa. This name has remained from the Roman times. Nadiža was then the main river in eastern Friuli. The river didn’t run in the same course as it runs now. 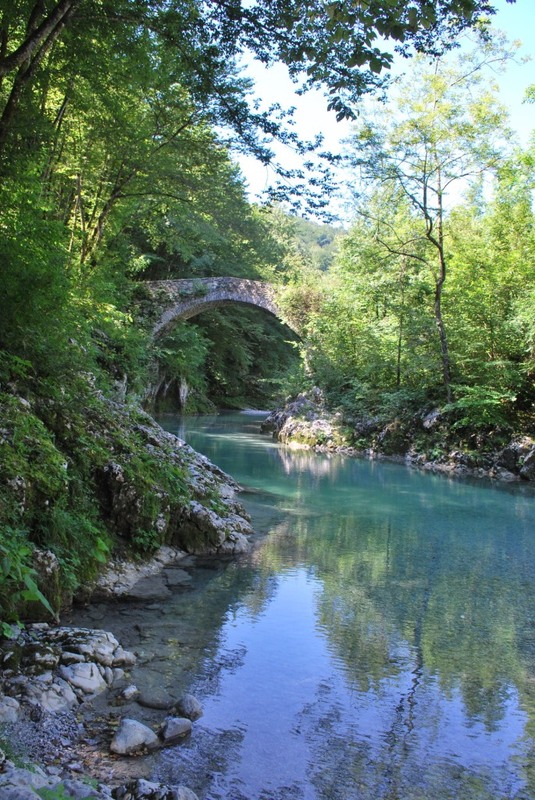 The roman historian Plinij names her as one of the rivers which run into Adriatic between Timavo and Piave. The Langobard historian Paulus Diaconus describes a big flood in 585 AD. The flood was so strong that many rivers changed courses. Another big flood hit the area in 1490 which altered the river courses again. Historians and geographers still argue how the river courses shifted in time. What is obvious is that Nadiža and Ter used to flow more to the east and formed a big navigable river which flowed past Aquileia in Roman times. The name Nadiža is ancient and remained unchanged in the last millenniums.